Seagreens blog: Where and how is Seagreens harvested? Seagreens is harvested from the islands of the outer Hebrides in Scotland. Sustainability is very important to us and we have worked extensively to develop a sustainable method of harvesting. 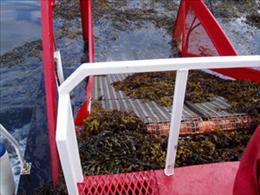 Only naturally regenerating seaweeds are used for harvest. All the seaweeds harvested by Seagreens are human food quality. It is vital to ensure seaweed and seaweed products have used human food quality seaweed and it has been properly tested for contaminants. All Seagreens products are rigorously tested to ensure they are safe for human consumption. Wrack seaweeds are chosen because of their highly nutritious properties and broad range of nutrients. The seaweed is cut in crystal clear waters to allow them to re-grow. Only living plants are harvested, no drifting, beached or root seaweed. Once harvested, the seaweed is then cracked or granulated to produce the Seagreens products. It is milled on the spot to make sure the product is fresh and has nothing added or taken away. Seagreens are certified free of environmental contaminants, toxic metal and microbial pathogens. They are fully organic and approved in line with Biodynamic standards in the EU and USA.